We spent over 15 hours researching 12 different types of basketball hoops and found that backboard material, height, and warranty were most important. The Spalding Portable Basketball Hoop scored high marks in all categories making it our top pick. The 60” backboard is made of glass making it feel like a professional hoop. It can be adjusted in height from 7.5 feet up to 10 feet so all of the kids could use it. We liked that it could be moved easily thanks to the multi-wheeled castors and convenient handle. The base holds 50 gallons of sand or water for added stability. With the many choices of portable basketball hoops available in all price ranges, it may seem a bit overwhelming to figure out what is different about the styles and which one will be the best choice for you. We’ve done a lot of research and talked to people in the sports industry to learn all about these popular items. We’ve chosen three of the top portable basketball hoops that are in many top ten review lists and gone into detail about each one, listing why they are in the top ten, what features they have and what customers like about each one. All of the information is right here at your fingertips, all in one place, so there’s no need to waste time going from site to site trying to find what you’re looking for. Our objective with this review is to take the guesswork out of purchasing a portable basketball hoop and help you make the choice that will make you happy and KEEP you happy years down the road. Searching all over the internet can be time consuming. We’ve saved you the time and energy by doing all the legwork for you and now all you have to do is learn about what we’ve put here and make your decision on which portable basketball hoop is right for you. The Spalding “Beast” 74560 Portable Basketball Hoop is the number one portable basketball hoop on many top ten lists despite its higher price. It has a 60” glass backboard, a two piece, 5” square angled pole system with a screw in water level base and the Pro Image breakaway basketball rim. It is adjustable from 7.5’ to 10’ and can adjust to the different heights easily with a screw jack adjustment system. It is easily moved from one place to another using the multi-wheeled castors with engaging handle. This portable basketball hoop was designed with security, mobility and fun in mind. The four strut pole base mount allows for superior rigidity so you know you’re not playing on something that feels like it could break at any second. The base has a 50+ gallon capacity and can be filled with sand or water which adds stability and safety to a fun sport that kids and adults alike love. The glass backboard is the most expensive kind of backboards you can buy but it is also the best, providing the most bounce of all the backboard materials that are used, allowing you to play and feel like a real pro. 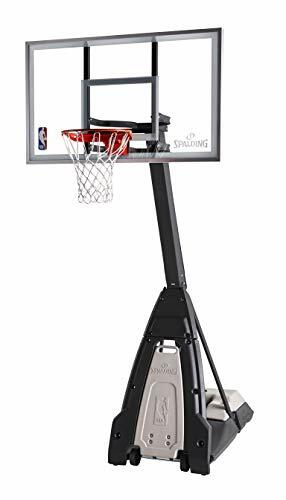 The Spalding portable Basketball System has a tempered glass backboard that measure 54” across with a heavy duty solid steel Arena Slam breakaway rim. The pole is a 3 piece, four inch square pole with 4 strut mount that gives plenty of support. With a height range of 7.5’ to 10’ the screw jack adjustable height system makes for easy changes. Use water or sand in the 40 gallon capacity base for stability and support. It’s a great basketball hoop for anyone who loves the game and will last a long time. This portable basketball hoop is built for convenience and fun and it’s easy to see why. 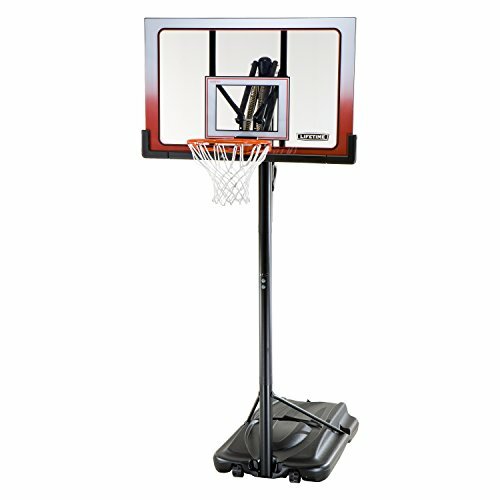 The Lifetime 52” Portable Basketball Hoop System comes with everything you need to set up the goal. A clear, polycarbonate backboard, supported by a steel frame is shatterproof and has fade resistant graphics to show the target zone. Measures 55” x 33”. Mount the backboard to the 3.5” diameter, telescoping pole made of steel that can adjust with one hand due to the convenient Action Grip Height Adjustment. Goes from 7.5’ to 10’ easily. The hoop has a Slam-it Rim which is built to last and take plenty of slam dunks with its double-compression springs and supportive ½” steel braces. The 35 gallon capacity base can be filled with sand or water and it can be emptied if the hoop has to be moved. There are many great things to love about the Lifetime 52” Portable Basketball Hoop System including its extraordinary price. It is the least expensive of the three and you don’t lose quality at all. Portable Basketball Hoops are a lot of fun whether you put them in your driveway, at your place of employment or somewhere else. Even though assembly can be a challenge with most portable basketball systems, including those not listed here, it is a piece of equipment that will get a lot of use and enjoyment. The three listed here range from very inexpensive to a professional grade hoop that is more expensive. All are great choices for anyone looking to purchase one. What is a Portable Basketball Hoop? A portable basketball hoop is a standalone unit that includes a pole, base, rim and backboard. The base can be filled with either sand or water and typically has wheels on one end for moving from one place to another. They are very popular for putting in driveways for the kids to play basketball with as they don’t require a post to be installed into the ground or concreted in. They are not as solid as in-ground posts, however, a good quality portable basketball hoop can handle recreational play and even harder play between adults. As long as it is assembled correctly and the base is filled, it provides plenty of stability for enjoyment. The NBA was founded in the 60s but even into the 80s basketball wasn’t the popular sport it is today. Not many people had access to a basketball court and having one at home definitely wasn’t common at all. This all changed when the heavy hitters in the industry decided to create something that people could use to have fun with the sport from their own backyards. This is when the portable basketball hoop was born. Two major companies, Lifetime and Spalding, were the first to come up with this concept. It started with a simple backboard and hoop that could be mounted on the outside of garage doors. While this was a popular method, they further developed the idea and designed a completely independent system that packed up in one box and contained everything a person needed to set up a portable basketball hoop including the base and pole. 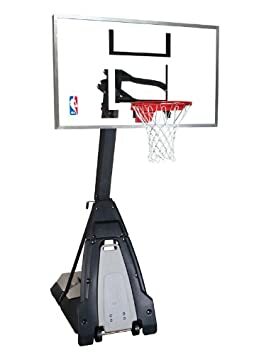 They made it even more appealing by adding the capability of adjusting the hoop height and the popularity of having your own basketball hoop system exploded. Now you see them everywhere and many people have them in their driveways and even at the office or loading docks of companies to add some stress relieving exercise for the employees during break times. There are many benefits that a family can receive by getting a portable basketball hoop. It’s a sport that can be played by anyone of any age and it’s been around for a long time. Many people only like to play it for recreation or on a rare occasion. Some love to set up trick shots and have fun that way. Others are a little more serious and want to have basketball games with friends or family. And then there is the person who seriously wants to perfect the sport, especially shooting, and will use it to practice for hours at a time. Whatever your reason is for liking basketball, the portable basketball hoop enables all of these reasons to be fostered. There are many other benefits as well. Introducing your child to sports – this is one of the most common reasons someone might get a portable basketball hoop for their home. Children love being active and also playing with their parents, so having something that allows them to learn a fun sport while hanging out with mom and dad makes these wildly popular with children. A normal sized basketball hoop is way too tall for a young one of 4 or 5 to play with but with the adjustable height, it can be lowered to its lowest height and young children can begin to learn the specifics of a sport that will stay with them throughout their lives. The great thing about portable basketball hoops is that as your child grows and increases their skill, the hoop can be raised to higher and higher levels until it is at the standard height. Develops New Skills – Having a portable basketball system at home enables kids, teens and adults to learn all kinds of new skills they may not have had before. Your arms and legs will become stronger, your agility will improve, you’ll become faster and can even learn things about discipline and competition. Get Healthy. Stay Healthy – Childhood weight problems are at an all time high and it is largely due to the inactivity of kids in today’s society. Instead of running around playing chase and doing various sports, children are sitting in front of video game consoles and computers. Having a portable basketball hoop is a great way to incorporate exercise into your child’s life without it feeling like exercise. Before you know it, they’ll be slimming now from the new activity and you won’t have to have them diet at all. (Diets for children are not a good idea due to their growing bodies) It’s especially effective if they see YOU out there too so be sure you’re setting a good example. Becoming a Better Basketball Player – Sometimes a child will really take to basketball and want to become serious about it. Having a portable basketball hoop at home allows them to practice on a daily basis and improve their skills and performance. It is a must for anyone who wants to play basketball on a competitive or professional level. All portable basketball hoop systems come with a few standard components. Depending on the type of component it is, there will be some variations among different types of units. Hoop – this is the circle that the ball goes through to make a basket. It’s usually made of metal of some kind like steel, and there are two types that are the most common: breakaway and spring-loaded. Both of these styles detach themselves from the backboard when too much pressure is exerted on the rim. This prevents damage to the backboard. The standard size of the hoop is 18 inches and the thickness is usually 5/8 to ½ inches. Most people who play basketball play with standard sized basketballs, so almost all hoops will meet these specifications. Backboard– The part of the system that the hoop is attached to is the backboard. Backboards will vary in material and size and also in color variations as well. The professional dimensions for a backboard are typically 45” to 50”. For beginners and causal players the board can go all the way up to 72”. Materials for the backboard can be anything from Plexiglas to resin. They are most commonly either fan shaped or rectangular. The shape of the board also has to do with the skill of the player. Beginners seem to do better with rectangular backboards and they offer more space for them to shoot and bounce the ball off of. Net – This is the part that is attached to the bottom of the hoop. There are many different variations in nets from model to model. The length can range from 15” to 18” and the thread count can be anywhere from 30 to 120. They can also range in color from plain white to red, white and blue. There are two basic types of portable basketball hoop systems: crank and pneumatic. Crank styles provide the user with a lot more durability and accuracy but the pneumatic styles are much easier to assemble and adjust. One potential problem with pneumatic styles is that they can develop small holes that allow the air inside to leak. This can hinder the accuracy of the shoots. What are You Looking For in a Basketball Hoop? If you’re looking for ease of installation, you will love a portable basketball hoop. Once they are put together, you can move them to different locations via the wheel casters that are on the bottom of the base. Some units might be a bit challenging to put together initially but there is the option of hiring someone to put it together for you. Many people do this and are extremely happy with the speed in which the professional assemblers get the goal together and up. You can get a lot of stability from your portable basketball hoop by filling the base with sand if you are fairly certain that where you put it, it will be staying for a long time. You can also use water, but sand is heavier and weighs down the base better than water and allows for a bit rougher play. There are many pluses that come along with using a portable basketball hoop. They are easy to upgrade to additional special features like spring-loaded or breakaway rims if your system doesn’t already come with them; many do. Since they are designed to play anywhere, you can set them up on any even surface in your front or back yard or the driveway. Many people who live on dead end roads with a cul-de-sac will put a portable basketball goal at the edge of the cul-de-sac for the neighborhood children to play with. There is no need to mix cement the way you would have to do for in-ground poles. With the portable basketball hoop, you can typically get it assembled and ready for playing within a few hours. For additional stability, you can add additional sandbags to the base on top of what you use inside. In fact, many customers who buy a portable basketball hoop will fill the base with water and then add sand bags to the top of the base. This makes the base able to be emptied in the event you need or want to move it, and the extra sand bags on top give it even more sturdiness. This type of basketball system is great for people who may have to move a lot due to their jobs. Since the system can be folded or taken apart and the base emptied, you don’t have to leave it behind. You don’t want to disassemble it all the way, but you can take it apart some to make it better able to be loaded onto a moving truck. If you ever need to store your portable basketball hoop, you will love the ease in which the system can be stored. It doesn’t take up a lot of room either. These portable basketball hoops are not as expensive as some other systems although you can purchase high end portable basketball systems that have a lot of features or special materials that will cost a lot more. A quality system can be just as durable and will last just as long as the in-ground systems do with the proper care. What Height for the Goal is Good for Your Child? When the portable basketball goal will be used for only adults, it can be kept at the standard 10 foot height. If children only are using it, or both adults and children will be using it, you want to make sure that the unit your purchase is able to be adjusted easily. Most units adjust from 7 feet to 10 feet. There are even a few that lower as low as 5 feet. If it’s not adjustable, then the young members of your family won’t be able to play and enjoy themselves as well. So what height is the right height for the goal for your child to have fun? It depends on the age of your child. If you have elementary age children you will want to lower the goal to 7 feet for them to truly enjoy playing with it. You can raise it to 8 or 9 feet for children that play in youth basketball leagues and standard 10 feet for children in Junior high and above. Adjusting your basketball hoop can be done through different methods depending on the model you purchase. Your instruction manual will explain exactly how to adjust your particular type of portable basketball goal. The two most common are hydraulic and springs. Springs can last a long time and are one of the easiest and most reliable methods for adjusting the basketball hoop. The hydraulic system is most often used on smaller backboards and can be a bit difficult or awkward to work with. You want your portable basketball hoop to last as long as possible and it can with the right care and maintenance. It doesn’t require a lot, but there are some things you can do that extend the life of your goal and keep it in good condition. Taking Care of the Rim – The rim of the basketball hoop is very unlikely to wear out, but they can rust or get bent or broken by the unit falling over onto the rim, or by people dunking or hanging on it. These units are meant to be kept outside, but weather can still ruin your goal, especially wind. If the goal gets blown over during a windstorm, the rim can be broken off or irreparably bent. If you are not able to store the unit in the garage somewhere during a horrible storm like a hurricane, then tilt the basketball unit over onto its side so it can’t blow over and consider taking the rim off until the storm passes. Preventing Rust – If you want to ensure that your portable basketball hoop won’t rust get into the habit of covering it during rain storms or periods of non-use. It may seem like overkill but protecting it from the elements can prevent rust and other weather related damage to be caused to your basketball hoop system. Follow the Instruction Manual – In the instruction manual of your basketball hoop system, there will be some maintenance tips for your specific unit. Follow these and that will also extend the life of your basketball hoop system. It will also have some information about the amount of weight the rim can hold during dunking so pay close attention to that as well. Maintenance will include things like tightening bolts, lubricating the parts that are removable and other suggestions that you should heed. Also make sure to adjust the height level periodically even if you don’t have children who need it lowered. This prevents the height adjuster from getting locked into one position in case you ever DO need to lower it for some reason. If you are a professional or league player or one of your kids is aspiring to become a professional, there are some minimum features you need to ensure that the portable basketball hoop you purchase offers. Make sure that the goal is a water resistant unit with rustproof coating. Also be sure that there are nylon protectors where metal parts meet to prevent rust. It needs to have thick and sturdy padding around the post, base and underneath the goal as well. Make sure the backboard is made from shatterproof or tempered glass. Look for models that are easy to put together or invest in having someone else do it. If you can find everything above AND find one that has hoop lights that is another perk for playing in lower light times. Finding the right portable basketball hoop doesn’t have to be a chore or even difficult. With the information contained in this buyer’s guide you will be able to look at the different styles and units, see the features and choose the one that will fit your needs now and on down the road too. This purchase is definitely an investment and getting the right unit, you can have it for decades. It’s easy to find several styles that will work for your needs, budget, children’s ages and space that you have to install one. The prices will range from as low as $100 to as high as $1000. Be certain to look at the features each one offers, and see what customers are saying about the units you’re interested in. If you take the time now to use this information to your advantage, you will purchase a portable basketball hoop that you and your children will love for a long, long time. It’s a purchase that many consider to be an investment since they can last so long. The cheaper model you purchase, the more likely you are to encounter a less sturdily made unit, so be careful. You don’t always have to go for the most expensive either. There are plenty of excellent styles available that will fit your needs at a great price too.